Album Info: What a racket! Buy a pile of junk from a railroad, fix it up juuuuust enough to run and lease it back to that railroad or their competition. Description: Resting at CSX Wauhatchie Yard. Description: Awaiting it's next assignment at Wauhatchie Yard. Description: Switching at CP Wells near the old Southern Peagram Shops. Description: A FooMed leads a very weathered and worn Ex-SP leasor. Description: What a racket! Buy an old NS junker and turn around and lease it to the competition. Description: S/B at Wyvern Yard. Description: Almost over the mountain and on to Waaaaaaaaaaaaahatchie. Description: Leased power helps an NS train north thru Cleveland, TN. Description: An Ex-BN helps out a Q train. Description: An Ex-BC Rail, now leassor, helps the "Kodak Express" northward thru Tenn. Description: Y106 is not just a Country radio station in Atl., it's also this Cartersville Yard Job. Description: A Western Gal spens her 2nd life being rented out to Southern Boys. Description: An ex-MPI leaseor awaits a crew or more locomotives on CSX Q679 nr. Howell (used to be) Tower. Description: CSX Q215-24 waits out the signal in the morning sun. Description: This bloody nose leads an unknown CSX mixed freight N/B thru Dalton. 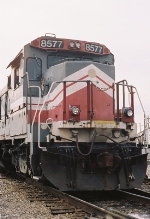 Description: Q583 moves S/B thru Ringgold, Ga. with 2 leased units and 2 CSX units. Description: A FooMed leads a N/B mixed thru Historic Kennesaw. Description: With Lookout Mt. in the backround, Q583 heads South with merchandise for Atlanta and points beyond. Description: On a Q train heading South thru Lookout. Description: Well now that Mr. Helm has gone to a different paint job, I'll shoot these more often. 3rd unit on CSX Q582. Description: The new HLCX paint job compliments of CSX Huntington Shops. Boy, that shade of blue sho' does look familiar! Description: Spare unit for NS work train working between Dalton, Ga. and C'nooga, Tenn. Lived at the house track in Varnell for several days. Description: This old DME unit looks like a good candidate for HLCX's paint deal with the Huntington Shops. On CSX S676. Description: On Q581 thru Dalton, Ga. Description: What bug leases locomotives now? Description: On NS 284 nr. Waring, Ga. Description: An HLCX leasor on an NS train. Description: A former Tronite now lives out it's days as a rental. Description: 2nd unit on Q583. Description: S/B thru Dalton on the CSX. Leased power getting bigger 'eh? Description: DIT to Atl or Macon. Description: DIT on a S/B from C'nooga to Atl. Description: A S/B CSX mixed merchandise passes thru Dalton. Description: A N/B autorack has a leased unit leading on this fine Autum day. Description: 2 old tunnel motors work for different lines from what they were built for. Description: Formerly an SDP40, this Alstrom rebuild is now leased to CSX. Here, she is pulling Q583-17 Southward past the old NC&StL control tower. Description: Was an SDP40 in another life. Description: One of Mr. Helms fine piece of.....machinery totes a S/B mixed through Cartersville. Description: An SD45 shell turned SD40-3 basks in the AM sun. Description: Now apparently a GCFX leasor, this Western Veteran helps pull roadrailers south to East Point, Ga. Description: NS 22Z waits out a signal in Varnell, Ga. Description: This is what we around N. Ga. refer to as a "Brian Morgan Special". Let's just say he's a little bit of an EMD fan. 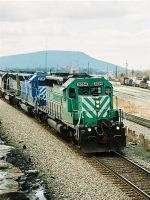 Q583 slows to a stop to leave a cut of cars at "The Ramp" in Dalton, Ga. Description: CSX Q583 heads into Dalton, Ga. with it's City aglow with Christmas decor. Description: Serving as the power for A702 for a few weeks.